As the weather gets a little cooler, we get into my favorite time of year. I love the colors on the trees, cozy sweaters, and football- oh, how I love football. Along with all of that, I start to really use my slow cooker a lot, and there are few things I like more than working on perfecting my chili. There are a ton of chili recipes out there, and more than a few of them involve beer. I found a recipe that I liked, and then changed a few ingredients around. This particular recipe is a little different than most of what's out there, but that's part of what made it fun to try. Heat oil in large skillet over medium-low heat. Add onion; cook and stir 5 minutes. Add garlic; cook and stir one minute. Add turkey to skillet; cook and stir until no longer pink. Drain fat. Add remaining ingredients, stirring until mixed. Transfer to slow cooker. Cover; cook on low 8-10 hours. In hindsight, I could have done a little less of the hot sauce, but that's just because I'm not a huge fan of very spicy food. The Big Guy liked it, though, and probably would have added more hot sauce from the beginning. 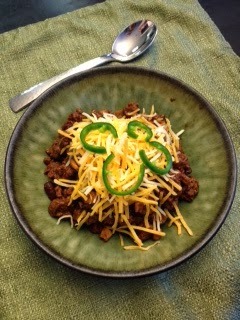 I served it with some shredded cheese and sour cream, but you can use your favorite chili fixins. That's right- fixins. I will say, this is not a light chili. It's really filling and has some big flavors. I'm glad that the recipe called for ground turkey because I almost think it'd be too much with ground beef. Having said that, I was a big fan of the chipotle flavors mixing with the molasses and the stout flavors. 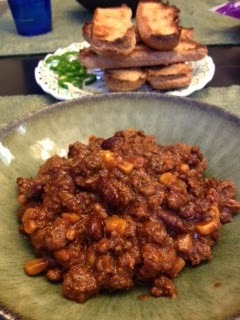 If you're looking for a chili recipe with great flavors that's just a little different, this one won't disappoint!